Could the future of the music industry be distilled down to...applause? 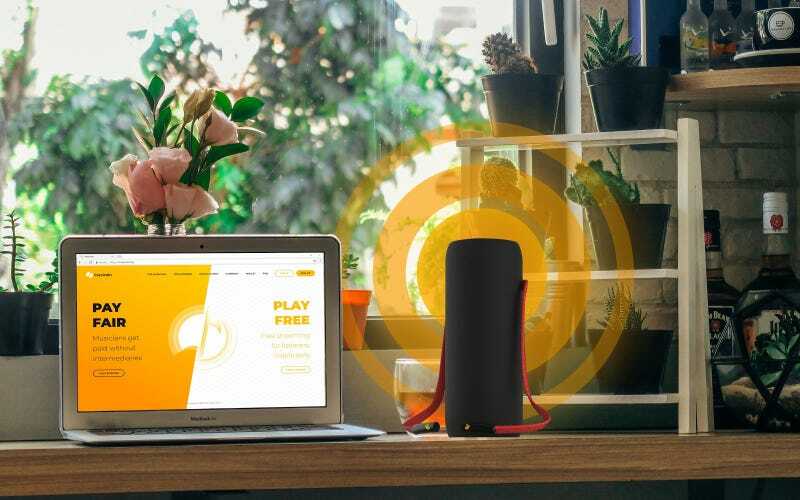 Volareo smart speaker honors creativity with royalties that make today’s popular streaming services seem downright stingy (Musicoin currently issues $.10 USD per play at the time of this writing.) Volareo allows music fans to further engage their favorite artists by tipping various amounts of Musicoin simply by clapping their hands or pressing a button on a mobile app. Clap, and digital money goes to your favorite artist. So how does it work? Once you’ve purchased your Volareo speaker, you’re automatically given $10 worth of Musicoin to stream music or “tip” artists by clapping. Note: This only works for music and musicians who’ve set up accounts with Musicoin, so it’s not like you get to listen to all music of all time here. It essentially boils down to paying-per-stream, but hey, it’s ethical: Instead of artists requiring thousands of streams on Spotify or some other competitor to make pennies for their work, fans can directly support those acts by clapping. The reality is: Smart speakers are a lucrative market, one currently dominated by Amazon and Google Home (Apple, too, is trying to get into the game.) Why would that matter to a music-specific device like Volareo? Well, Amazon, Google, and Apple all have premium music streaming services already (Amazon Music, Google Play, and Apple Music, respectively,) so while Volareo might approach the industry from an ethical artist-and-consumer standpoint, it’s entering the fast-growing market already behind the curve. It’s certainly an interesting idea for a post-streaming future of music, but I’m not hopeful about the Volareo speaker—it doesn’t really seem reasonable to expect people to clap at a speaker to support the artists they love. But hey, maybe you would.